I’ve always been a big fan of the wrap dress. With its cinched waist and its deep neckline, the wrap dress is a form that I have known and loved since I was a teenager. Why, you ask? I have been told that it is flattering for my body type. I tend to feel supremely comfortable and beautiful in a wrap-style dress. In 1974, Belgian-born American fashion designer Diane von Fürstenberg launched the wrap dress as a fashion style. The wrap dress quickly became Diane von Fürstenberg’s signature dress. 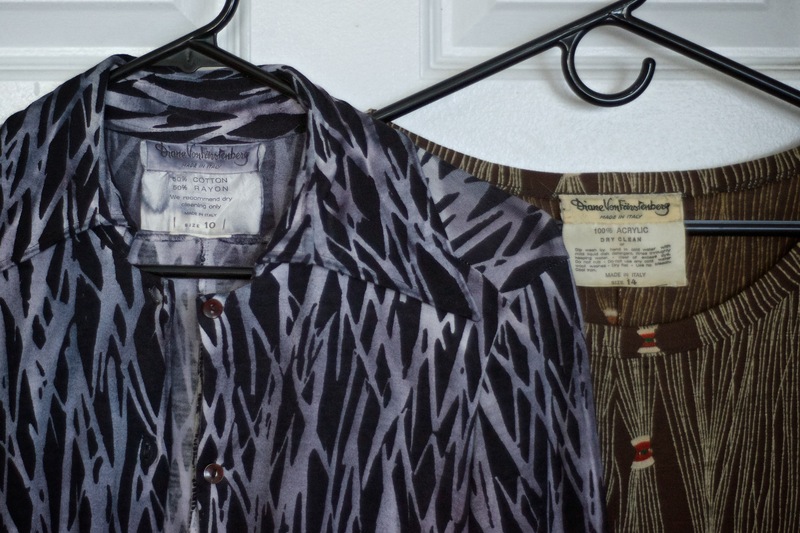 I am lucky enough to own two vintage Diane von Fürstenberg dresses from the 1970s. I found them both on suburban thrifting adventures when I lived in Vancouver, BC. One of the dresses is in Diane von Fürstenberg’s signature 1970s style and pattern (featured on the cover of 1976 Newsweek magazine above), but without the plunging neckline and waist tie. 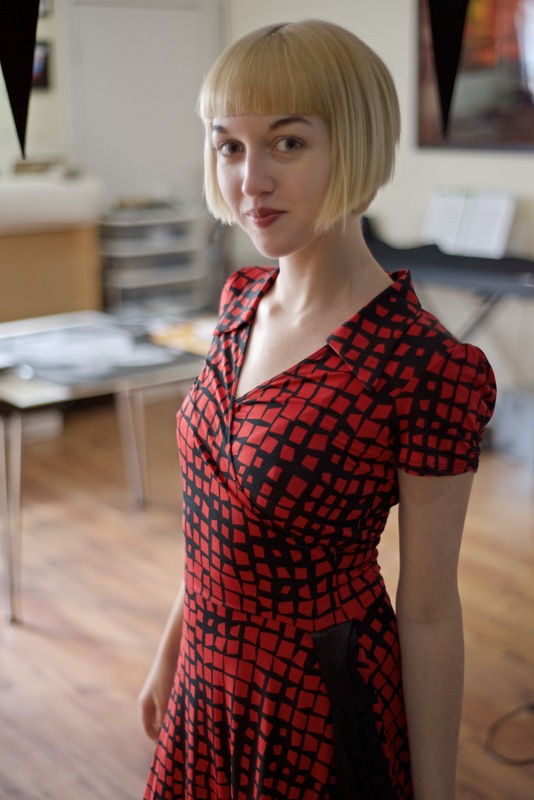 As you can see here, the boldly cut collar and matching cuffs place this dress undoubtedly in the era of the 1970s. The pointed collar and cuffs evoke a classy vampire feel. There is something very Morticia Addams about it, which I like. The other is a more loose-fitting dress that reminds me of a 1970s country-style muumuu. According to the tag, the dress is quite a few sizes larger than I normally wear: during my early twenties, when I found this dress, I preferred wearing oversized shirts and dresses to form-fitting ones. I often pair this dress with a denim jacket and black leather boots. I first discovered the wrap dress in my late teens, when I became conscious of my supposed ‘imperfections’ and sought to subtly hide my tummy. My tummy was my so-called ‘problem area’— the part of me that I didn’t like as much as my arms and legs. On those weeks when I felt particularly off, the wrap dress always managed to help me feel comfortable in social settings. Of course, this was when I was particularly uncomfortable in my own skin, and before I had the community of feminists, queers, and the body positive movement in my life. Indeed, this was before the “f*ck flattering” hashtag had graced the screen of my Macbook. I had never thought to think critically about this notion of wearing “flattering” clothes. I am lucky enough to have a mother who is immensely loving, supportive, and non-judgmental: and yet even she, with all her good intentions, gently guided me into this world of wearing clothes and colours that are “flattering” on me. For example, baggy pants and boxy shirts hide my “cute figure” (her words, not mine) and should therefore be avoided. Similarly, beiges and pale yellows “wash me out.” Today I am opting for a middle ground. While it can be useful for us to know what types of forms, styles, shapes, colours, patterns, and fabrics make us feel the most comfortable and beautiful, it is also worth keeping in mind the ways in which this discourse of “flattering” prevents certain bodies from being able to wear what they want to wear due to this rather arbitrary and socially sanctioned standard. I still wear wrap dresses from time to time, though I’ve also gotten more comfortable with wearing forms that I used to think were “unflattering” on me. Recently I discovered a red and black patterned wrap dress in my parents’s basement: the dress, reminiscent of the 1980s, was one of my favourite scores from Le Chateau Junior Girl when I was fourteen years old. Back then the dress hung off of my thin and boyish frame: I was thrilled to discover that it still fit me after all these years. Now, at the age of 26, I feel healthy and happy with the way that I look. Who knew I’d ever come this far?